Tara Farms: The Count Down! 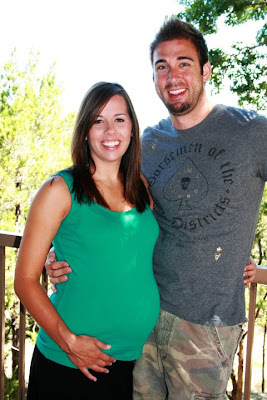 Last weekend we went to help Tori & Colin finish preparing the nursery for Luke. G-pa put the stroller and swing together while Haley and I helped Tori wash tons of baby clothes (that boy is going to be well dressed!) and organize all of the other baby necessities. How can one small person need so much stuff?! We got the new clock hung and the cute letters to fill the frame over the bed. Colin got home in time to hang another rod in the closet. We even added a handy little gate to keep Hannah out of Luke’s room—sorry, no puppy hair allowed. The nursery is precious! The pictures really don't do it justice. Tori & Colin have finished their childbirth classes and after a comical diapering lesson with a sock monkey—I do believe the Bryan house is ready for Luke to make his appearance. Aren't they a good looking couple?! This is going to be one cute little boy!!!! haha! funniest diaper experience yet...can't wait until Colin has to do the real thing! love it! seriously so thankful for the help. Colin would have come home to a crying, pregnant wife and a room full of chaos!! Shame I missed the diaper episode... Should have videoed that one with the new video camera we bought you! !